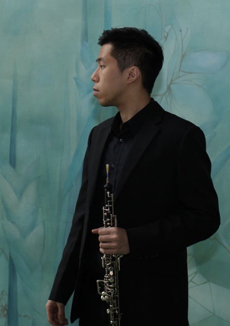 Matthew Chin Lok-man majors in oboe at the Hong Kong Academy for Performing Arts and has performed with many orchestras abroad. He has performed with Musica Viva, Philharmonia APA, the Guiyang Symphony Orchestra, the Gustav Mahler Orchestra (Hong Kong), and the Tapiola Sinfonietta. Last year he toured with Philharmonia APA to Vienna, performing with the Vienna Boys’ Choir. He participated the 2017 Busan Maru International Music Festival as principal oboe of the Gustav Mahler Orchestra. He is a member of Ob.session, the first ensemble in Hong Kong featuring all instruments of the oboe family.